The "Fleming Family History" is currently under construction. Anyone that has information or questions on this family line please "email me". The names show in "Marroon" are the ancestor's of my children. Samuel (2) was born the son of Malcolm Fleming on April 2, 1707 in Ireland. His Irish family can be traced back to the still existing Castle of Slane. He was evidently the first member of this family to come to America in ca. 1740. He married "Esther Mounier" in Ireland prior to coming to America in ca. 1735. Esther was born on January 6, 1714. Her parent's names and siblings are currently unknown, however her parents were French Huguenots who left France and moved to Ireland to escape papal persecutions. 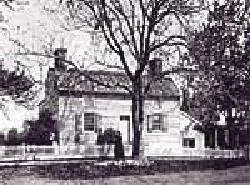 Samuel (2) and Esther purchased 105 acres of land in what is now Flemington, New Jersey. Samuel (2) however had to have his "Castle" auctioned off to pay his debts in 1765. It was purchased by Dr. George Creed, the first physician to practice in the Flemington NJ area. The house changed hands five (5) times until it was donated to the DAR by the last owner, Mrs. Charles D. Foster in 1928. Samuel (1) passed away on February 10, 1790 and it is unknown where he was interred. The date of Esther's death and where she is interred is currently unknown. He and his wife had 10 children. 6. *Elizabeth Fleming - b. 1737, d. ?? 8. William Fleming - b. 1741, d. ?? 9. Alexander Fleming - b. Mar. 27, 1743, d. ?? 10. Agnes Fleming - b. 1745, d. ?? 11. Mary Fleming - b. 1749, d. ?? 12. Isabella Fleming - b. 1752, d. ?? 13. Samuel Fleming - b. Jul. 27, 1754, d. ?? 14. John Fleming - b. Dec. 11, 1756, d. ?? 15. Charles Fleming - b. Dec. 24, 1759, d. ?? Family Notes: Alexander (9) married "Elizabeth Pensiler" on July 17, 1765. Charles (15) married "Elizabeth Worrall" and they resided in the Philadelphia, PA area. Esther (7) was born the daughter of Samuel and Elizabeth (Mounier) Fleming on April 15, 1739 presumably in Ireland. She married "Thomas Lowrey" in 1756. He was born on September 3, 1737 in Ireland. Thomas came to America in 1747 at the age of 10 with his widowed mother and her brothers. His parent's names are currently unknown. Esther's (7) husband Thomas became a landowner when he was only 13 year's of age. He purchased 650 square feet of land from his future father-in-law Samuel (2). He eventually became a successful shopkeeper on that same spot in Flemington. Thomas was elected to the first provincial Congress for New Jersey in 1775. He served in the New Jersey Assembly in 1791 and 1792. He was commissioned a Lieutenant Colonel in the third regiment of the State Militia, promoted to Colonel where he served as the supply officer. It is said that Esther (7) and Thomas were very loyal supporters of the American Revolution. Once it is said that Esther (6), upon hearing of an American disaster, rushed to her husband with the news and saying, "Thomas, get up and mount the old mare and ride as fast as you can and find if the dum ly is true!" In 1780, when the American army's scarcity of supplies caused great hardships, Esther (7) was chosen to be a member of a committee of women whose goal was to seek contributions for the relief of the soldiers. They raised $15,408.00 in twelve days. Esther (7) and Thomas also donated the land for the Baptist Meetinghouse in Flemington which was the first church in the town. They moved to Alexandria Township in 1785 after selling their land in Flemington. "Thomas Lowery" - "Esther Fleming Lowery" - "Samuel Lowery"
Margaret (16) was born the daughter of John and Elizabeth (Fleming) Sherred (6) on January 17, 1772. She married "John Shepherd" who was born the son of Richard and Mary (Servis) Shepherd on March 17, 1779. Margaret (16) and John lived in the vicinity of East Locktown, NJ. Margaret (16) joined the Baptist Church there in 1818 with her husband John. Her husband served the church as a deacon and a trustee. He also served on the local school board. Margaret preceded her husband in death on September 5, 1834 at the age of 62 and was interred in the old Locktown Baptist Church Cemetery, west of town, sited by a stream. 20. *John Shepherd, II - b. 1808, d. ?? "John Shepherd" - "Margaret (Sherred) Shepherd"
Hester (17) was born the daughter of Thomas and Esther (Fleming) Lowrey (7) on September 14, 1760 in Flemington, NJ. During the Revolutionary War she met and fell in love with a British Cavalry Officer. Her father being an American Colonel did not help this love affair, however, her parents did not interfere. he wedding date was set for April 17, 1777 and all of the festive preparations were made. Hester (17) however caught a cold which developed into pneumonia and she died two days before her wedding date. On her wedding day she was laid to rest in her coffin dressed in her wedding gown and she was interred in the Case Family Cemetery in Flemington, NJ where her white marble headstone bears her name and the following: "Departed this life on the fifteenth of April, 1777, age sixteen years, seven months, & one day".